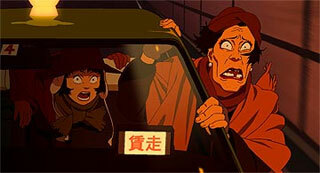 The third film from Satoshi Kon (Millennium Actress, Perfect Blue) rachets the state-of-the-art of anime film-making up another notch. This movie is simply astounding. Every nuance and detail of the characters is brilliant. Most live-action films do not contain this kind of depth of character and story. And of course, this being a Kon film, just when you think you know what's going on, he twists it on it's ear, and it becomes a very different film from what you were expecting! 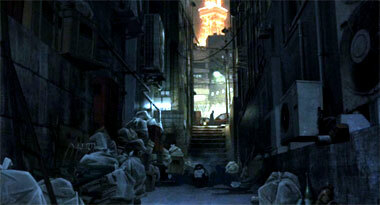 The film centers on three homeless people, and how their lives are affected by finding an abandoned baby in the trash. Setting out on a quest to find the original mother, they get themselves into a variety of adventures, while they each learn about each other and the true checkered past each of them carries in their hearts. We won't give away the ending, it's just amazing. 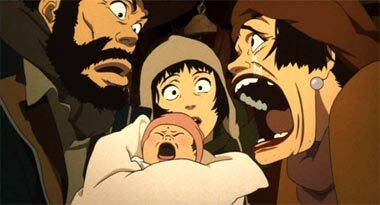 Tokyo Godfathers deserves to win best picture — not best animated picture, but best picture — it's just that damn good. This DVD release is NOT dubbed, but presented in Japanese with English subtitles — as it should be. 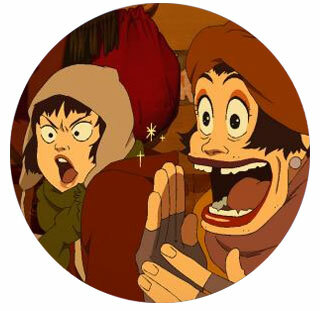 Below: Scenes from Tokyo Godfathers.